The National Student Financial Aid Scheme (NSFAS) will on Thursday host a briefing detailing how 2016's funding will be distributed. The Department of Higher Education released an additional R6.9 billion to make up for the shortfall this academic year. On Wednesday, Vice-Chancellors, NSFAS leadership and the Higher Education and Training Minister Blade Nzimande met to discuss their funding issues and disruptions at several universities across the country. 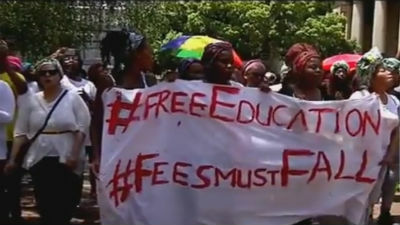 On Monday, the ANC announced that R4.5 billion would be allocated to the National Student Financial Aid - on top of the additional R2 billion promised by government following the #FeesMustFall campaign in 2015. Higher Education minister says this shows their commitment to addressing the financial shortfalls of thousands of students. He says Vice-Chancellors, the NSFAS as well as government will continue to work together to ensure that all students accepted to study at varsities will not be financially excluded. Chairperson of NSFAS, Sizwe Nxasana, says in 2017 - criteria for the qualification of financial aid will change. The pilot project will launch next year in a few selected universities. He says this is to address to challenges faced by the students of the "missing middle" group. The students are those whose parents earn above the R122 000 income threshold stipulated buy the scheme but also cannot afford to secure a bank loan. The R122 000 benchmark has not been increased in several years despite the cost of living increasing. NSFAS Chairperson, Sizwe Nxasana, says they are working on a new model with different qualifying criteria for next year. Meanwhile, universities affected by violent students’ protests in 2015 have recorded damages worth more than R150 million. Lecture halls were vandalised, property destroyed during demonstrations in various campuses including the University of the Western Cape, University of Pretoria and University of Johannesburg. In 2016, private security was brought in to prevent violent incidents from happening. It was revealed this week that universities are forking out an average of R2 million a month for the extra security. The Chairperson of Universities South Africa and Wits University Vice-Chancellor Adam Habib, says the presence of private security personnel will remain on campuses to avoid further damage to property and prevent disruptions to academic and administrative processes.